Applying to college is stressful, and finding the funds to pay for it isn’t always easy, either. Luckily, there may be more financial aid resources than you are aware of — and you don’t need to be the world’s best student or demonstrate financial need to qualify for all of them, either. In fact, Colorado’s Department of Higher Education works with post secondary institutions in Colorado to provide grants and stipends to state residents, and additional aid can be applied for through the schools themselves. How can you start your own college journey? Let’s discuss the four steps all Colorado residents should take to fund a college education. The FAFSA, which stands for Free Application for Federal Student Aid, is your first step in paying for college. This form is used to connect students with multiple sources grant and scholarship dollars, so it’s a necessary form to fill out regardless of what state you live in, or where you plan on attending college. Brace yourself, however; it’s a long form. (That’s why we’ve created a guide to help you out along the way) Still, few scholarships and grants accept applications without the FAFSA, so it’s in your best interest to complete it. Some types of financial aid that are offered directly through the college you plan to attend. The FAFSA can be submitted before you’ve received your college acceptance letter, so there is no need to wait to apply. In fact, it is best to apply as soon as possible so that you don’t miss out awards that may have application deadlines. After you fill out the FAFSA, take a look at some additional state-funded aid for Colorado residents. The College Opportunity Fund (COF) is a state-funded stipend for Colorado residents who attend in-state schools. Colorado Student Grant is sponsored by the Colorado Department of Higher Education and is awarded to students who demonstrate high amounts of financial need and who are enrolled at eligible Colorado post-secondary institutions. The grant is applied for through FAFSA, and specific requirements and award amounts can be found on the participating college’s website. Dependent Tuition Assistance Program is sponsored and administered by the Colorado Department of Higher Education for dependents of police, firefighters, and National Guard who have a parent that is deceased or disabled as a result of his or her service. This award may cover full tuition fees, on-campus living, and room and board at a college of the recipient’s choice. Colorado National Guard Tuition Assistance Program funds in-state tuition for members of the Colorado National Guard after the COF stipend is applied. Members can apply through the Department of Military and Veterans Affairs. Additionally, Colorado’s Advancing Students for a Stronger Tomorrow (ASSET) program provides undocumented students with in-state tuition and eligibility for the COF stipend at Colorado public colleges. Students who qualify for ASSET must submit proof of their in-state residency, usually through a high school diploma, and sign an affidavit confirming a commitment to seek legal status once eligible. You can view all documentation requirements here. Most Colorado colleges comply with the ASSET program, and may be able to provide you with more aid specific to the institution. If you’re a current high school student, schedule regular appointments with your high school guidance counselor to stay up-to-date on local scholarships. Set a notification on your phone to help you be on time and not miss an appointment. It’s always a good idea to do your own searches online, as well. Check out the financial aid websites for the colleges you are applying to, or call them up on the phone. Additionally, private organizations in Colorado offer financial aid. The Denver Foundation is one that offers a wide array of grants and scholarships, and, despite the name, you don’t have to live in Denver to qualify for all of them. Never Forgotten Scholarship in memory of the 13 victims killed at Columbine High School in 1999. Recipients of this award are nominated from selected schools for demonstrating leadership and performing volunteer acts in their schools and communities. Helen M. McLoraine Opportunity Scholarship for students who have received services from select non-profit agencies within the last 15 years as a result of challenges or extraordinary circumstances, and who are actively taking steps to improve their lives and advance their education. Helen M. McLoraine Opportunity Scholarship for Foster Care and Emancipating Youth for students who were previously in the foster care system for a minimum of two years (total) between the ages of 13 and 18. The scholarship is applied for through FAFSA and provides a maximum award of $10,000 a year to qualifiers. The Reisher Scholars Program for rising college sophomores and transfer students from community colleges who demonstrate academic leadership and potential. 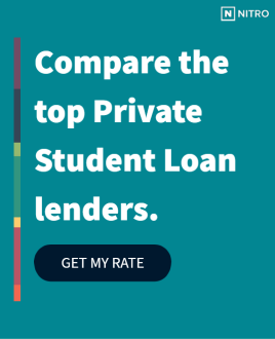 If you still haven’t come up with the aid that you need, a private loan can help you make up the difference that you’ll need to fund your education. Before taking out any Colorado private student loan, check out our free NitroScore tool. Simply enter a college and major to find out your total costs, salary after graduation, potential loans needed, and a score that tells you how easy those loans will be to repay based on projected salary. You can even play around with different college/major combinations and customize the results with info about scholarships, grants and savings. Colorado residents shouldn’t have to tackle the cost of tuition alone. Start planning for your education today!